A Complete Summer of Lilies! Unsure what lily to plant? It's easy with the All Summer Lily Garden! 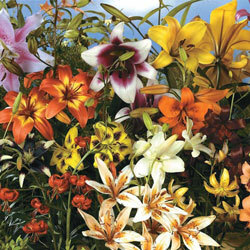 It includes a mixture of oriental, tiger, Asiatic, trumpet and species lilies. So you'll enjoy a variety of colors, flower shapes and blooming times all summer long. Foliage Type: Linear, glossy dark green leaves arranged in whorls or spirals up erect stems. Flower Form: Large petaled flowers in various forms - funnel shaped, bowl shaped or with recurved petals. 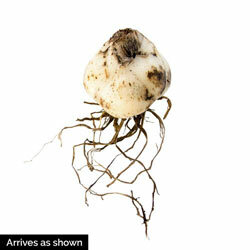 Planting Instructions: Bulbs need to be planted at least 6" deep and 6-9" apart. Incorporate organic matter and bulb food will enhance establishment and blooming. Soil Requirements: Prefers well-drained soil but will tolerate heavier soils. Winter Care: If fall planted, mulch the first winter. Remove in early spring before growth starts.